One of the timeless components of spring fashion has always been the use of florals in everything from clothing to accessories — and now nail art. Start with a base coat of ‘Private Access’ and let it fully dry. 1. Using strips of tape, section off a thin vertical stripe on every nail except the ring finger, where you’ll tape diagonally. 2. Starting with light yellow, make small organic shapes on each of the nails with the vertical strips. (This is an abstract design, so don’t worry about making the shapes perfect.) Paint the diagonal tip of the ring finger turquoise. 3. One by one, layer on organic shapes of the orange, blue, turquoise and red. 4. When the ring finger is dry, peel off the tape. 5. Do the same organic design on the top white half of the ring finger as you did in numbers two and three. You don’t have to tape it off if you’re careful not to overlap on the turquoise. 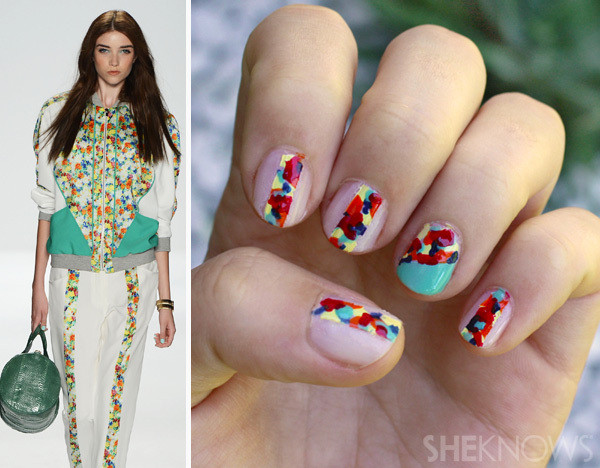 When all the colors are dry, gently peel off the tape and paint top coat over your nails. 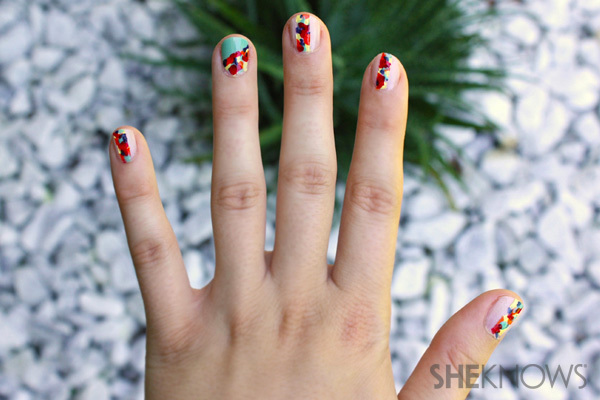 Your nails are now ready for spring!